Colder weather means colds, the flu and other bugs begin to rear their ugly heads. 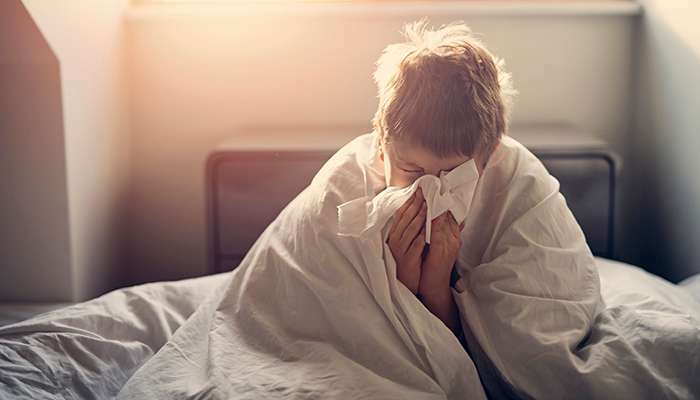 It can be hard as a parent or guardian to decide when a child is too sick to go to school or daycare, but our providers have some recommendations that will help during the upcoming “sick season.” Pediatrician Nicole Baumann-Blackmore, MD, offers these four pieces of advice. Dr. Baumann-Blackmore says it is generally best to keep a sick child home if he/she has a temperature of 100.4 degrees Fahrenheit or more. Vomiting and diarrhea are two other signs that it’s time to keep kids at home to rest. Also, if your child feels too ill or fatigued to participate in their regular school day activities, it’s best to keep them in bed. “It’s important to remember that kids share their germs quite readily, so keeping them home when they have symptoms is important not only for their own health, but for the health of others, as well,” Dr. Baumann-Blackmore says. Viral gastroenteritis, or the stomach flu, and pink eye are two illnesses that can spread quickly through young children. Dr. Baumann-Blackmore says if a child comes down with the stomach flu, keep him or her home until their symptoms have completely resolved. Pink eye is another illness that spreads quickly, most often viral in nature, but can sometimes be caused by bacteria. Since it is frequently difficult to distinguish between the two, pink eye may be treated with antibiotic ointment, so that kids can return to school or daycare. Ear infections aren’t contagious, so kids can return to school or daycare whenever they feel up to it. Hand, foot and mouth disease (HFMD) is very common in young kids. It can initially present itself as a fever that then evolves into sores in the back of the throat and mouth. It then typically causes a rash on the hands and feet. Dr. Baumann-Blackmore says it can be hard to diagnose in the early stages, but once sores develop, the diagnosis becomes more apparent. Kids should stay out of daycare while they have a fever, are getting new skin lesions and until all of the blisters have crusted or dried. Dr. Baumann-Blackmore says one reason HFMD spreads so easily is that kids can spread the virus for weeks after the clinical illness resolves or even if they are otherwise not showing symptoms. Head lice used to be another reason to keep your kids home from schools, but it isn’t anymore. According to the American Academy of Pediatrics, a child with active head lice has likely had the infestation for one month or more by the time it is discovered. The AAP says the child should remain in school but be cautious not to have direct head contact with other students. However, Dr. Baumann-Blackmore says while some schools have accepted these recommendations, others haven’t. It’s important you check with your school or daycare to find out about individual policies. A good rule of thumb is to be fever-free for at least 24 hours (without using over-the-counter medications like acetaminophen or ibuprofen). Children should also be able to eat and drink normally and have energy to participate fully in their school activities. While this is a good rule, it is important to note that many schools and daycares have their own policies regarding illness, and parents/guardians should consult those individual policies. “Being a parent is hard, and I have yet to meet a working parent who hasn’t felt guilty about sending their child to school when the child isn’t feeling completely 100 percent (this mom included! ),” Dr. Baumann-Blackmore says. It really is a balancing act. Dr. Baumann-Blackmore says keeping your child home so he/she can rest and recover and not spread the illness to others is important, but so is your job and your child’s education. “If your child is on the mend, fever-free and able to participate in everything at school, let go of the guilt,” Dr. Baumann-Blackmore says.